Irritability during menopause can prove challenging and frustrating. Outside factors are always important to consider when assessing this symptom, but what you put into your body may be even more important. 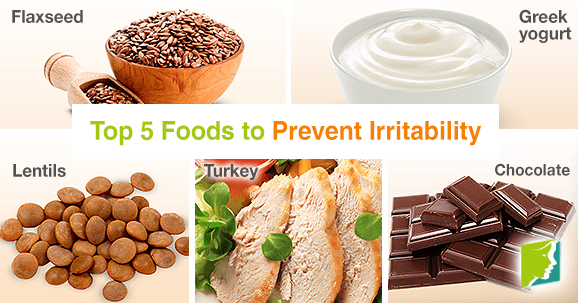 Read on to learn about five foods that can help prevent irritability before it starts. Perhaps the most versatile of the foods that prevent irritability, flaxseed can be sprinkled on everything from cereal to smoothies to baked goods. It provides mood-boosting nutrients like omega-3 fatty acids that also lower cholesterol, improving overall health. This grain is especially great for women experiencing hormonal imbalance, since its high phytoestrogen content works to balance dipping estrogen levels and relieve several symptoms. Foods like Greek yogurt, which are rich in protein but lower in fat and sugar than most dairy desserts, can prevent irritability by giving the body the fuel it needs to function at full capacity. This low-fat dairy product also enhances the levels of dopamine and norepinephrine, two neurotransmitters scientifically linked to positive mood. A mainstay of many vegetarian kitchens, lentils are known to satisfy appetites without the harmful side effects of too much red meat. This wholesome legume contains a high concentration of vitamin B9, also known as folate or folic acid. Research has shown that low folate levels can be linked to depression and aggravation, so adding this food to a balanced diet can help prevent irritability in a natural way. Turkey is often thought of as a holiday treat, bringing up memories of happy times. But turkey can actually prevent irritability all year, thanks to its high levels of L-tryptophan. This amino acid acts as an antidepressant. The ultimate feel-good treat, chocolate sometimes gets a bad reputation as an indulgence, but its ability to prevent irritability and improve general mood has been thoroughly researched. Darker varieties in particular, as opposed to milk or white chocolates, contain theobromine, a caffeine-like stimulant that significantly improves mood in the short-term. Additionally, it works to produce serotonin, the third and most well-known feel-good neurotransmitter in the brain. In moderation, it is the perfect after-dinner treat. When added to a healthy diet, these foods can make all the difference in treating irritability from the inside out. Try incorporating them into your daily meals to start improving your symptoms naturally. Click on the following link for further information on how to treat irritability.